Much of surround-sound terminology boils down into numbers such as 2.0, 5.1, and 7.1. These surround-sound numbers sometimes refer to the playback system’s speaker configuration and sometimes to the audio signal format being delivered. The first number represents the number of speakers or main audio channels involved, and the 1 or 0 after the decimal point indicates whether the system has a subwoofer or supports a low-frequency effects channel. Systems that end in 1 have a subwoofer or an effects channel. 2.0: Normal stereo — the kind with a left and a right channel (or a left and a right speaker). 5.1: This is the primary format for creating and delivering surround sound. It’s widely used in movie theaters, digital television, DVD-video and audio, and even the latest game consoles. Source signals have the five main channels and one LFE (low-frequency effects) bass channel. Playback systems usually have five main speakers and one subwoofer. A 5.1-channel surround-sound speaker configuration (five speakers and one subwoofer). 5.1-channel-ready: Such an audio system has six discrete inputs to accept a 5.1 signal from a signal source such as a 5.1-channel DVD player. It does not necessarily mean that these products can decode signals to a 5.1-channel output. The best way to ferret out true 5.1 systems is by reading reviews of the devices before you buy. 6.1: 6.1-channel systems have an additional surround channel called the back surround channel. This drives a speaker (or preferably two) situated right behind the viewers, in essence providing the same smooth flow in the back sound field that the center speaker enables in the front speaker group. Dozens of DVDs are encoded with extra back surround information for this back surround speaker, and these DVDs also play perfectly well on regular 5.1 systems. 7.1: Not to be outdone, some have taken the 5.1 or 6.1 channel encoding on a DVD and used some computer horsepower to create two independent back surround speakers for even more surround sound, making it 7.1. Note that 7.1 isn’t a true discrete surround-sound format (no DVDs on the market have 7.1 channels of sound); instead, it refers to the manufacturers’ own systems used to derive two back surround channels from existing stereo (2.0), 5.1-, or even the 6.1-channel sources just mentioned. 8.1 and beyond: You’ll probably hear about even higher designations — 8.1, 9.1, 10.2, and so on. 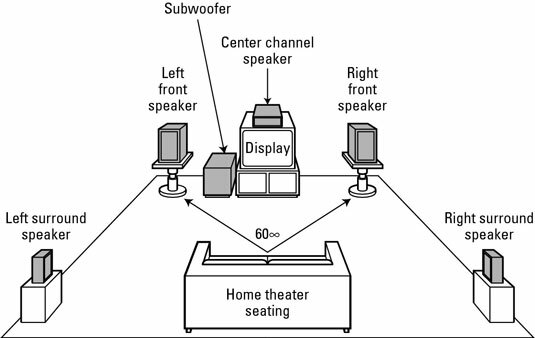 These are in the realm of the home theaterphile, and if you’re evaluating such gear, a home theater consultant is probably standing next to you, so just follow his or her recommendations. The newest systems (such as Dolby Digital Plus) can theoretically support systems up to 13.1. Wow!